Click on the picture to go to my website. These are 1' x 1 1/2" pendants. I just don't get around to posting on my blog as much as I intend - so...I'm going to try to keep this short on words, but still show you a few things about what's going on here and what we've got coming up! Instead of hand quilting for an hour or so in the evening, I've been trying to work on this quilt. I want to give it to some friends as a house-warming gift. It is called "What's the Point?" 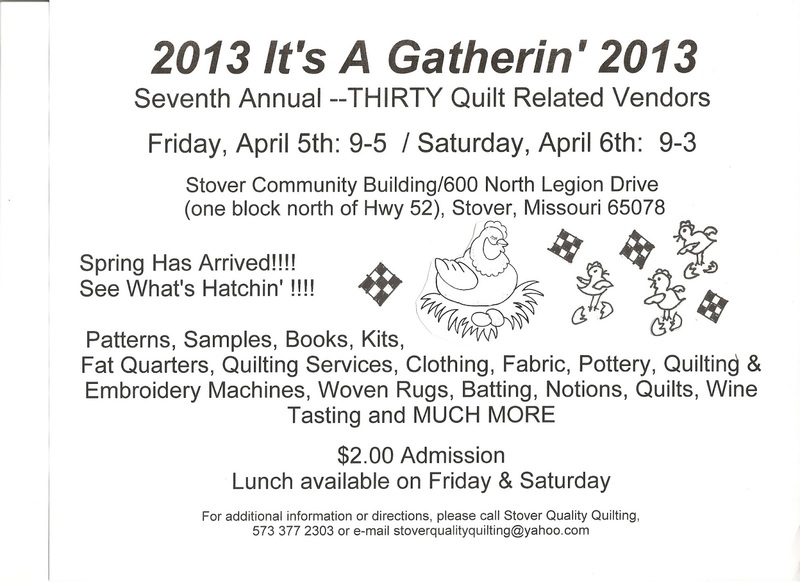 by Mark Lipinski and is in the March/April 2013 issue of Fons & Porter's Love of Quilting. I was on a roll, then when I put it all up on my flannel wall, my DH looked at it and thought it was ugly! He's not dumb enough to come out and say it's UGLY, but he just said..."hmmm...it's got a lot going on - is it your newest design?" (said kind of like...I hope not, because it's UGLY!). Well, whatever, I don't think it's ugly, it is colorful and I used all reproduction fabrics, but I chose brighter prints because that is what I think the recipients will like. I need to get back to it, but now I am too busy getting out the next charm for our "Charming" program, so it will have to wait a bit. These are fabrics from Lynette Anderson. There's more, but I don't know what happened to those pictures - I will have to retake them, because you just have to see them all! Lynette sent me some wonderful bundles of some of her fabric lines - one that you will see at Market this spring. So exciting!! She will have some new jewelry made out of these pretties! But unfortunately she has to wait until I return from my next show. Which brings me to the next topic! 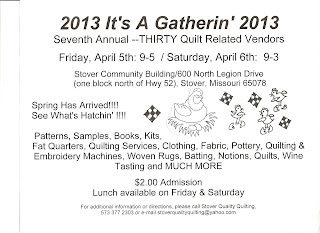 It is in Stover, MO - so if you are in the area, please come and see us, and if you're not in the area, why not plan a little road trip! With 30 vendors, it has to be fun! I haven't received a full vendor list yet, but I do know that Renee Nanneman of Need'l Love and Dawn from Sew Cherished will be there. Hope to see some of you there!! And you know I can't post without mention of the kitties! Ozzie keeps very busy taking naps in a basket in my sewing room closet. He occasionally gets little bursts of energy and plays with a mouse full of catnip, but then he needs another nap. And Callie is just...BUSY! Even though she is 3 years old, she still has an awful lot of kitten energy! Here she is holding down some books, looking irritated! Now, I have to get busy - it has been crazy around here, and we've got orders stacking up - so thanks to all of you for that! I also want to thank Lynne Hagmeier from Kansas Troubles - she gave me a little shout out on her blog that led some new people my way, which I really appreciate!! Lynne is opening a new shop and retreat and is now counting down the days and showing some of the items that will be for sale in the store. I sure wish I was closer - I would love to visit - it is going to be wonderful! Have a great weekend - Happy National Quilting Day, Happy St. Patrick's Day, and Happy Easter! My name is Julie Letvin and I started quilting in 1999. At the time we were raising two kids, I was working full time and earning my Bachelor's Degree, so there was not a lot of time for quilting. As life has evolved I have been lucky enough to be able to devote more time to doing what I love. My most recent venture is making paper pieced jewelry. See more on our website - www.meandmystitches.com. My jewelry can also be found in quilt shops throughout the United States and Australia. I love living in the Midwest near all of my family with my husband, Greg and all of our pets. Daisy . . . . .
Sewing Room Mess...Post on New Blog! It's the cat's house, I just live here. Autumn, the year's last, loveliest smile.